Abu Dhabi, United Arab Emirates- 5 January, 2019: Under the directive of H.H. Sheikh Hamdan bin Zayed Al Nahyan, Ruler's Representative in Al Dhafra Region and President of Abu Dhabi University’s Board of Regents, Abu Dhabi University is set to name the newest building on its Abu Dhabi Campus ‘Umm Al Emarat’—mother of the nation— in honor of H.H. Sheikha Fatima bint Mubarak, Chairwoman of the General Women's Union, President of the Supreme Council for Motherhood and Childhood, and Supreme Chairwoman of the Family Development Foundation. The AED 40 million building houses the College of Law and College of Engineering, and features a wide range of fully-fledged laboratories as well as academic and training facilities designed to the highest international standards. H.E. Dr. Ali Saeed Bin Harmal Al Dhaheri, Chairman of ADU's Board of Directors, expressed the University’s honor and pride to name its newest building after H.H. Sheikha Fatima. He highlighted that H.H. Sheikha Fatima is a national icon who won the hearts of people in the UAE through her countless acts of generosity and philanthropy. Bin Harmal highlighted that this occasion coincides with the nation’s celebrations of the late founding father Sheikh Zayed’s centennial and recognizes H.H. Sheikha Fatima’s outstanding role in empowering women and youth in both social and academic areas. The 9,742 m2 building is equipped with state-of-the-art technology designed to support academic and training needs. The new building is directly linked to the main campus through a bridge, allowing students and faculty ease of access. Adhering to international health and safety regulations, the ‘Umm Al Emarat’ building meets the One-Pearl Estidama requirements for sustainable design and construction practices. From an aesthetic point of view, the contemporary building was designed to the highest international standards and provides a positive and comfortable learning environment that fulfills the wide academic needs of students. 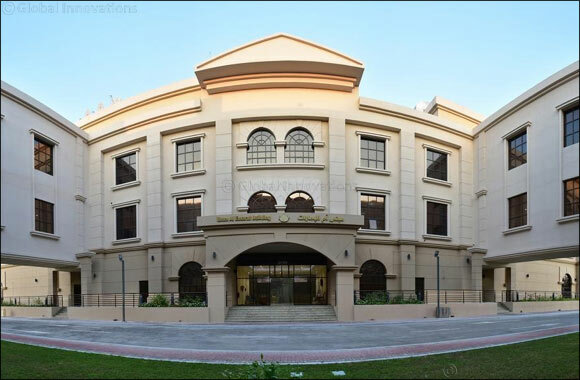 The building has 11 classrooms, 95 faculty offices, 24 laboratories, classrooms and multi-purpose halls. It accommodates a variety of programs including Civil Engineering, Electrical Engineering, Mechanical Engineering, Chemical Engineering, Computer Science, Aviation, Information Technology, and Architecture and Design. It is also home to the College of Law featuring a moot court that allows students to experience simulated court hearings.